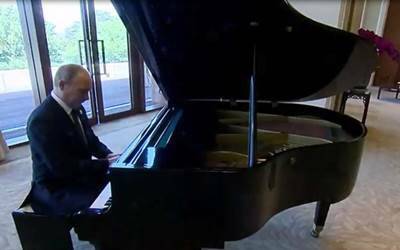 Beijing, May 15 (IANS) Russian President Vladimir Putin performed an impromptu piano performance as he was waiting for a meeting with his Chinese counterpart Xi Jinping here, the media reported. Putin, who is currently in Beijing for the two-day Belt and Road Forum, while waiting for Xi at the official residence on Sunday spotted the shiny black grand piano and played two Russian songs, "Moscow Windows" and "The City on the Free Neva River" — the unofficial anthems of Moscow and St. Petersburg, Sputnik news agency reported. Putin’s unexpected piano recital certainly was not the first time he has publicised his skills and hobbies outside the Kremlin, reports CNN. The annual Vladimir Putin calendar has showcased the President’s many passions, featuring him as an equestrian, a pilot, a shirtless fisherman and a cat lover.